As soon as C-3PO appears on-screen in the newest Star Wars movie, “The Force Awakens”, one of our favorite droids is noticeably different. The obvious difference in C-3PO’s looks, directly contrasting with the golden metal which has adorned C-3PO for many years and in multiple movies, is the addition of a red arm. 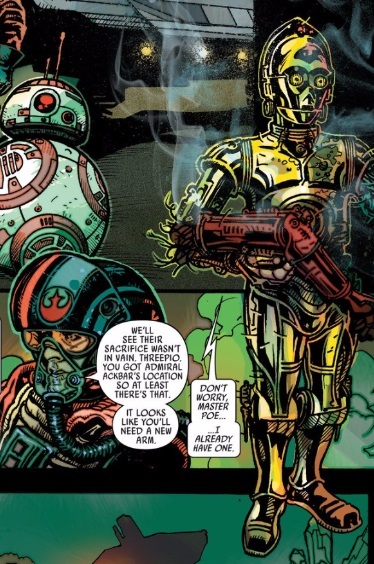 While this is glaringly obvious, C-3PO still feels the need to point this out as soon as C-3PO sees Han Solo. The question arises: How did C-3PO get this red arm? This question is the topic of a new comic issue that came out this month. 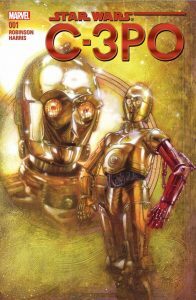 Star Wars: C-3PO (Issue 001) is a one-off issue with a story title of “The Phantom Limb” and shows the reader how C-3PO came to lose C-3PO’s left arm and gain a replacement red-painted left arm. While it’s not clear how much earlier than “The Force Awakens” this story occurs, it is not a long time before, since Poe Dameron is already with the Resistance. 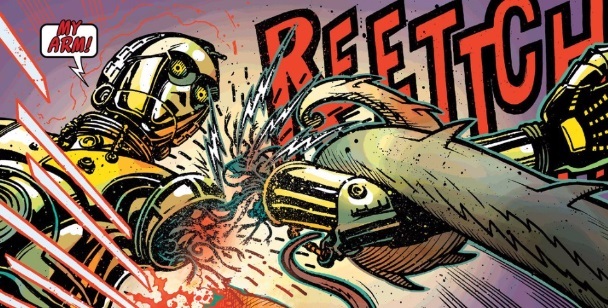 This story of C-3PO’s losing of the arm takes place amidst a larger story where a ship full of droids crash lands on a planet (which I am not discussing in this post (interested readers can go and purchase the comic to find out what happens in the story)), what is particularly fascinating is what we learn about droids, how they “think”, and, specifically, what’s going on in C-3PO’s “brain”. 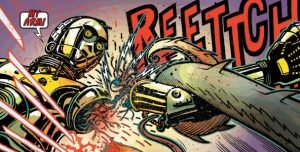 One of the droids with whom C-3PO crashes, Omri, is C-3PO’s main interlocutor. Omri is fascinated by the limits of droid “thinking”: “How our programming – human programming – makes us so much like humans, themselves,” remarks Omri. 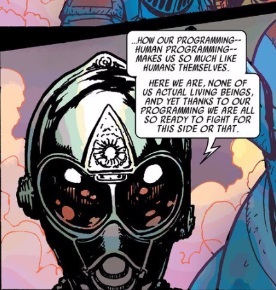 “Here we are, none of us actual living beings, and, yet, thanks to our programming, we are all so ready to fight for this side or that.” Omri seems to be unsettled by this realization. C-3PO picks up later on Omri’s musing and points out “It clearly bothers you, Omri, that our memories are in the hands of our makers. You’ve raised the subject more than once.” In response, Omri says, “It’s the curse of protocol droids like you and I, See-Threepio, that our tasks require an extra degree of sentience.” Omri’s observation of this difference of protocol droids from others in terms of sentience is such a fascinating articulation. Omri, however, continues on an interesting aspect of this: “I think that added awareness causes us to question. Flashes of past events – were they grand events or nothing to speak of? How important have I been? These questions nag at me.” These questions reflect quite a lot of self-awareness, especially of considering the past, in particular. It is also peculiar that Omri mentions “flashes of past events” – droids have these memories? Omri then directs its comments to C-3PO, “You, on the other hand, See-Threepio, blindly and eagerly obey your orders. I assume you recall nothing.” To this comment, C-3PO fires back, “That’s not entirely true, I see flashes for just a moment…places. Rocks…a factory of droids…an arena in the middle of battle…my body not my own…a green world with hills…underwater cities…a single city spread as far as my optical sensors could see…a temple on fire…smoky mountains of magma and fire. Suffering.” Of course, people will remember these scenes from the Prequel Trilogy before C-3PO’s memory was to be wiped at the end of “The Revenge of the Sith”. C-3PO then continues, “Yes…I have memories, too. And, yes, sometimes, I allow myself to wonder about them…but I also accept it is a droid’s lot in life to be in service of its master.” It seems that while C-3PO acknowledges these memories from a long ago past before C-3PO’s memory was wiped, C-3PO also feels that the present service of a droid’s master is paramount. Further on, Omri remarks, “It is said that a being who loses a limb sometimes feels as if that limb were still attached to the body and can be moved. A phenomenon known as a phantom limb. Having had my memories erased is like having a phantom limb inside my memory banks.” This notion of a phantom limb inside one’s memory banks then leads C-3PO to conjure Naboo, causing him to be abnormally quiet, perhaps while C-3PO is curious about such a past. It’s this final comment that is a key line in considering this story. While the title of “C-3PO: The Phantom Limb” presumably refers to the loss of C-3PO’s arm, it really points up the notion of phantom limbs residing within the memory banks of droids who have had their memory banks wiped, yet still retain some traces of memories pre-erasure. It seems that protocol droids have more sentience and have more memories than other droids.